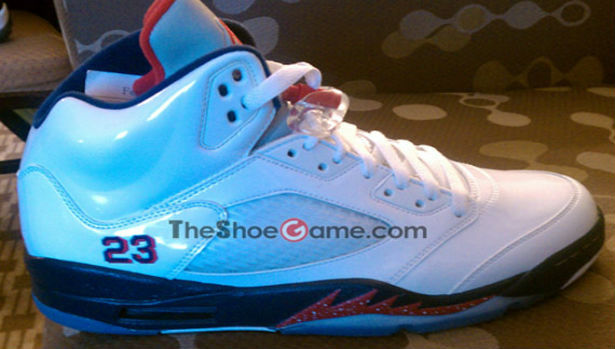 First look at yet another all new colorway of the Air Jordan Retro 5. Set to release later this year. With already a number of colorways of the Air Jordan Retro 5 set to release in 2011, we now have a look at yet another pair that is also set to hit. Possibly just warming us up for next year's much anticipated summer Olympics, this latest sample of the Retro 5 would be a perfect match for the Team USA uniforms. A little flavor is added with the use of a white patent leather upper, along with a silver 3M tongue. Varsity red and obsidian come together on the midsole, as well as the 23 heel logo. Varsity red hits the tongue branding and lacelock, and also adds a nice touch on the tongue lining. Not much has been said about this latest Air Jordan Retro 5, be sure to keep it locked to Sole Collector for the latest on an official release.